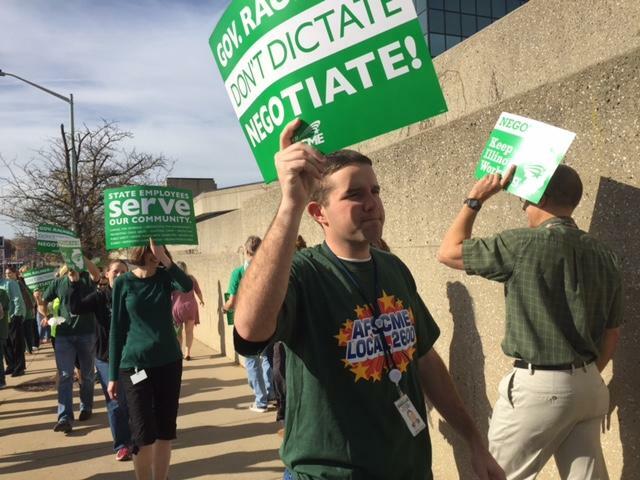 AFSCME members demonstrate against Illinois Gov. Rauner. The U.S. Supreme Court has chosen to consider a lawsuit known as “Janus V. AFSCME.” Through hearing this case, and most likely ruling in favor of it, the Supreme Court will use its power to attack union rights, to defund and weaken unions, particularly public sector unions. A favorable ruling on Janus will make it much more difficult for unions to collect dues or “fair share” agency fee payments from non-members in unionized public sector workplaces. This means that people can gain the benefits of a union contract without contributing to the union, thus reducing the income of the union. The Janus lawsuit is part a big business and right-wing anti-union campaign which includes many misnamed “Right to Work” (RTW) labor laws. These laws are designed to weaken and limit union power and are funded by big corporations and corporate-backed, anti-union groups like the State Policy Network. While state governments try to pass RTW laws, right-wing and other anti-union groups use courts to back up their general anti-union politics and propaganda. States that were seen as union strongholds, like Wisconsin and Michigan, have recently gone RTW. Twenty-eight states now have these anti-union laws, with five of these states passing RTW within the last six years. The momentum for anti-union schemes like RTW laws is growing. The Janus lawsuit is directed at public sector unions. However, the same forces that attack private sector unions are backing Janus. An injury to one, is an injury to all! Private and public sector unions should be leading a fight together, against Janus and the probable Supreme Court ruling. The public sector still has a union density of 34.4%, more than five times higher than that in the private-sector (6.4%). Janus is an attack on the strongest section of the U.S. labor movement. The backers of Janus hope that the weaker unions become financially, with a smaller dues and fee base, the less they can spend on contract campaigns, organizing new members, paying for organizing staff or strike funds, political and community organizing, legal representation, etc. There are many other reasons, other than RTW laws, that union density is so low and that organizing and contract campaigns don’t succeed much of the time. But anti-union forces hope the Janus case permanently cripples key public sector unions like AFSCME, NEA and AFT, and prevent the labor movement generally from recovering its lost strength. Other anti-union measures are often thrown in with RTW laws. These include limits to what a public sector union can legally negotiate for and even limits to how much a public sector union can ask for in wage increases. RTW laws hurt workers generally, not just unionized workers. A study by the Economic Policy Institute in February 2011 reported that wages in “Right to Work” states are at least 3.2% lower than in non-RTW states. Workers in RTW states make at least $1,500 less per year. Benefits are worse in RTW states with less employer paid health insurance and fewer pension plans. Most RTW states have the lowest union membership rates. A fighting labor movement could prevent the Supreme Court from ruling in favor of the Janus lawsuit. Mass movements in the past have forced conservative courts to back down from right-wing positions or even let some progressive rulings go through. A good example of this is the passing of progressive decisions like Roe v. Wade under the pressure of the mass protest movements of the late 1960s and early 1970s, and the recent decision on marriage equality. Internally, unions, especially public sector unions, are well aware of the threat Janus poses. It’s not just the decline in union dues and agency fees, it’s also anti-union groups being emboldened and conducting more decertification (union busting) campaigns if Janus is upheld by the Court. Corporations and their anti-union front organizations will spend millions to spread their anti-union propaganda, including enticing workers to not pay voluntary union dues. Unfortunately, however, the unions are not adopting a fighting strategy. The four biggest public sector unions – AFSCME, the Service Employees International Union, the National Education Association, and the American Federation of Teachers – have thus far responded to Janus with internal organizing and are also preparing to support Democratic Party candidates in 2018. The leaders of these big unions seem to have already given up on stopping the Supreme Court ruling in favor of Janus. The Janus ruling by the Supreme Court is likely to happen in June, long before fall elections. There is no guarantee that Democrats, if elected, will pay any attention to reversing Janus-based RTW laws. The example of the 2011 labor movement in Wisconsinshould be a warning. While a mass movement could have developed into a general strike, the union leaders instead focused on a recall election in which the Democrat they supported wouldn’t even promise to repeal the RTW legislation! The labor movement is still strong enough to form a united front of AFL-CIO and other unions and launch a proactive, public campaign to pressure the Supreme Court to reject the Janus lawsuit. To do this, unions would have to prioritize building a movement over lobbying tactics. The first step is to hold meetings in every unionized workplace in the country, followed by informational pickets outside public sector worksites like schools, building to a national day of action. In addition, links need to be made by the labor movement by using the human and financial resources of the labor movement, to help working people and youth already in struggle as part of social justice struggles like Black Lives Matter or the immigrant rights movement. The struggle against racist police violence and mass incarceration impacts the working class as a whole, including the lives and work of many public sector union members who provide services to inner city communities. The Trump administration’s crackdown on immigrant workers is part of the same anti-working-class offensive as the RTW laws and the Janus case. Also, some of the best jobs still available in urban areas are union, public sector jobs. And some of the most energetic and growing unions, like SEIU, are organizing among large sections of immigrant workers who often bring traditions of socialist politics and progressive unionism from their countries of origin. Unions have direct needs to break out of their isolation and take a proactive, visible, social union approach to defeating Janus, opposing Trump’s unpopular agenda, and re-energizing the labor movement. It’s not too late for unions to help link social justice struggles with demands like a nationwide $15 an hour minimum wage, Medicare for All, and free public education, to a mass movement to stop Janus and the “Right to Work” assault against workers.